Yep I know we are now over a week into January 2014 but it’s taken a week to go through all that we have achieved together in 2013 and pick out the best bits plus I’m still recovering from such an eventful crafty year & I’m sure many of you are too! 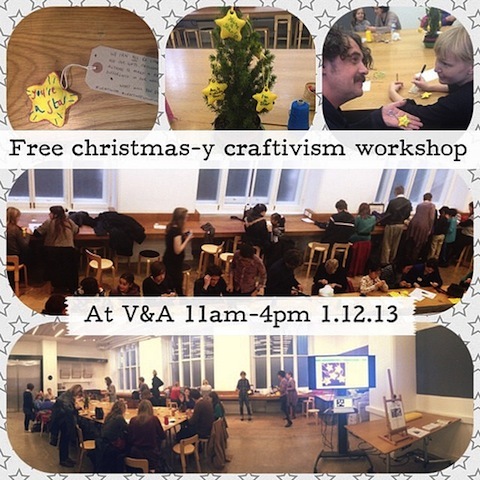 We hope 2014 brings more opportunities for people to engage in our craftivism activities wherever they are in the world. We also hope our products and services continue to be useful tools for people to reflect on global issues, how they can be part of the solution to global poverty and human rights injustices in everything we do and think, and we hope you will continue to help us share the benefits of our approach to craftivism with others. Without your support we cannot continue our work! Craftivist Collective is a social enterprise that relies on your support- If you enjoy this blog post, please comment, share &/or $upport us. 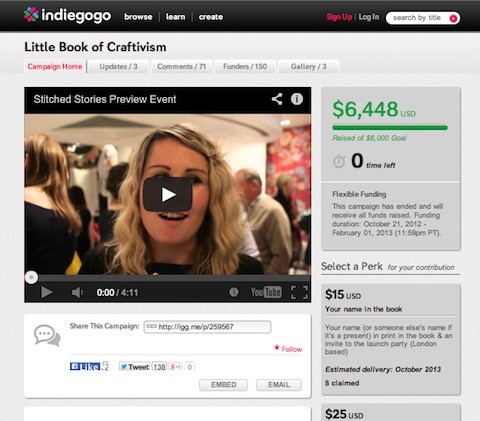 We reached our crowdfunding target of $6000 to part-fund or A Little Book of Craftivism with Cicada Books. 150 Craftivists & Craptivists from around the world helped us create this book & I love the fact that many of their names are in the list at the back of our book reminding us all what we can achieve when we work together. 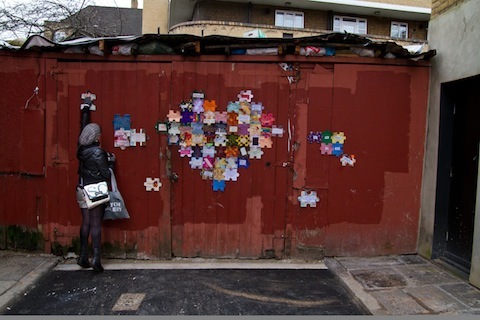 In the lead up to the end of our #imapiece Craftivist Jigsaw project supporting Save the Children we used some of the 700+ jigsaws from craftivists into a love heart installation to encourage people to show their love for their global neighbour this Valentines Day. This image was shared far and wide to help recruit craftivists to join in this project to tackle world hunger and ask ourselves & others to be part of the solution to world hunger not the problem. We did it! 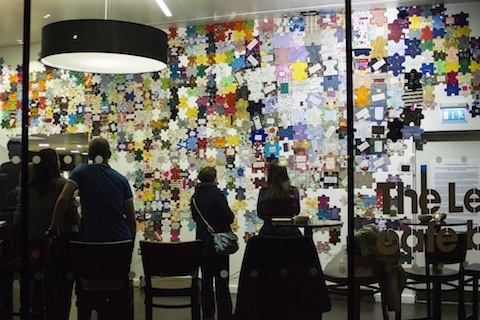 With the help of hundreds of craftivists from October 2012-March 2013 we created a giant art installation made up of more than 600 hand-stitched jigsaw puzzle pieces (now 700+!) which was unveiled at Manchester’s People’s History Museum on Friday 1st March calling for an end to the global food crisis and child malnutrition. It was so big its really hard to even fit all of the jigsaws in one photograph so here is a video of the project to capture the project. See the staggering results of how many people we engaged in this project from all the media exposure, over 50 stitch-in events, 103 MPs receiving jigsaws etc all here. Let’s keep remembering to be a piece of the solution to world hunger! As well as recovering from the Craftivist Jigsaw project we also experiemented doing new workshop formats such as delivering our first Trade School Workshop where people pay for a place on the workshop with a barter item that the teacher requests- I recieved a soya latte I requested, some dried strawberries which were super tasty surprise, a free advice session on funding applications amongst other things. I went on to do another Trade School in NYC. I got a surprise phone call whilst on holiday from the one & only (see what I did there?) 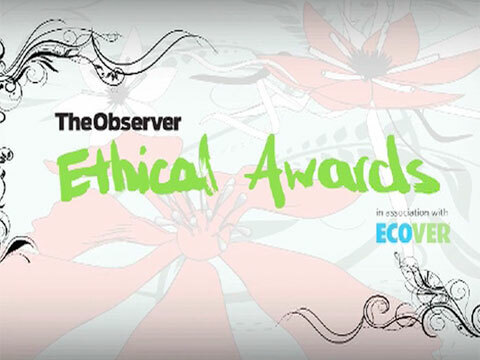 awesome Lucy Siegle saying that we have been shortlisted with 2 other organisations in the Arts and Culture category of Observer Ethical Awards (alongside the stunning film Beasts of the Southern Wild & the play Ten Billion!). We went to the party, got the amazing eco-good bag but sadly lost out to Beasts of the Southern Wild- a stunning film. 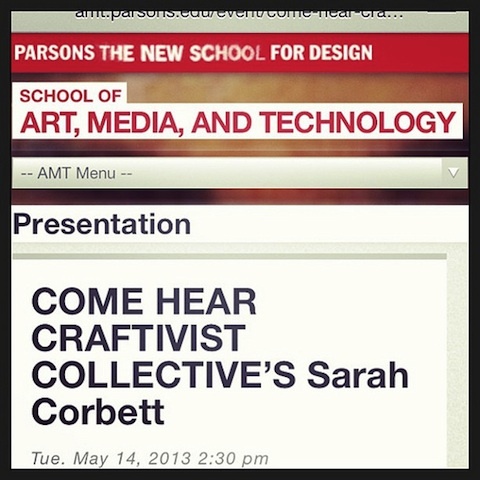 Whilst our #imapiece jigsaws where displayed at the IF Hyde Park event in London, I was in NYC being a busy craftivist- delivering a guest lecture to Parsons New School design students (Marc Jacobs went to that university don’t you know! ), a #popupcraftivist workshop in Union Square & getting to know staff at Etsy HQ in Brooklyn who are very cheap online pharmacy us supportive of our craftivism approach & going to encourage their Etsy Community Teams across Europe in 2014 to do our Mini Protest Banner project in their Etsy Teams. So cool hey!? As fashion-lovers many of us discussed how we felt deeply saddened, shocked and angry by the news that over 1,000 people, mostly female garment workers, have been killed in the collapse in the summer of 2013 of a building in Bangladesh which housed factories making clothes for Benetton, Primark, Matalan, Mango and other major brands. 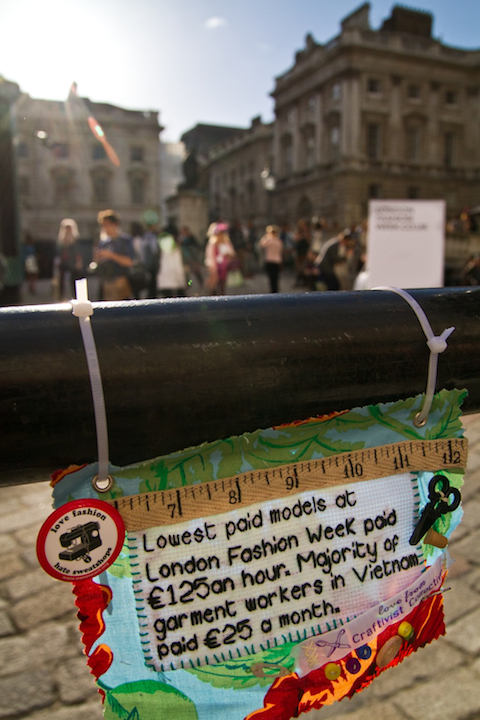 In response to that and leading up to London Fashion Week (Sept) craftivists around the world used our bespoke Mini Fashion Protest Kits to made small, provocative Mini Protest Banners to personally reflect on this issue of sweatshops and what we can do as an individual (consumer, voter etc) to keep the spotlight on this ugly side of fashion we CAN change. Supporting War on Want’s Love Fashion Hate Sweatshop Campaign we collected photographs from around the world of completed banners hung in situ and turned them into a patchwork of phtographs displayed at the Upcycling Academy at the Knitting & Stitching Show October 2013 to engage others in fighting for a world without sweatshops & supporting War on Want‘s www.lovefashionhatesweatshops.org campaign in a provocative but thoughtful way without people feeling threatened or preached at. The e-book Armchair Activist Handbook was published with a whole chapter written by the author of her experience of doing our craftivism projects and joining our events. And we relaunched our website- we hope you like it! A Little Book of Craftivism was published! 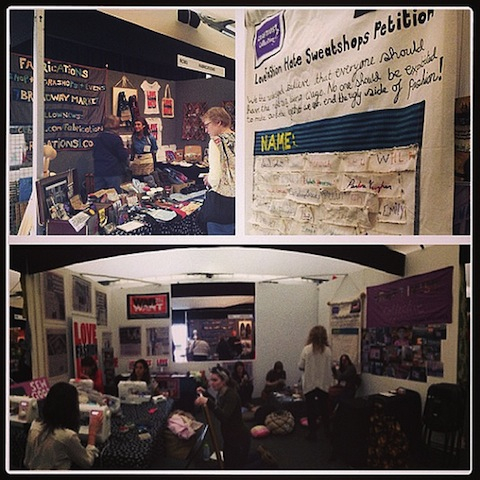 4 days as part of the Upcycling Academy at the London Knitting and Stitching Show- one of the biggest in Europe! We did so much in October I’m cheating and showing 2 images. At the same time as creating a craftivism project for Unicef campaigners, our A Little Book of Craftivism was published and we had the book launch party for our family, friends and crowdfunders- see the video of the party here. 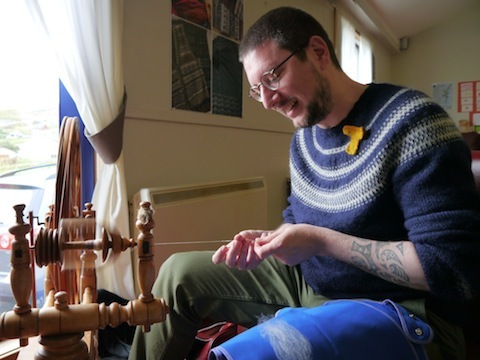 Plus we are part of the Upcycling Academy (UA) at the Knitting & Stitching Show this year which aims to provoke a thought provoking, hands on learning into textile waste, creative upcycling and better fashion industry practices. It is a collaborative project delivered in conjunction with Fabrications, Traid, War on Want and in 2013 we were been asked to joins the team too! We created a giant embroidered Love Fashion Hate Sweatshop petition for people to add their stitched signatures on to. Mollie Makes covered UA in their Jan 2014 issue. 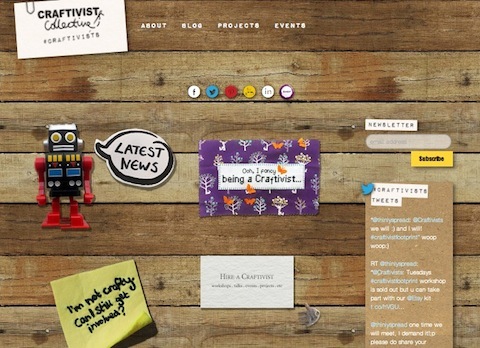 Which craftivism highlight from 2013 is your favourite? 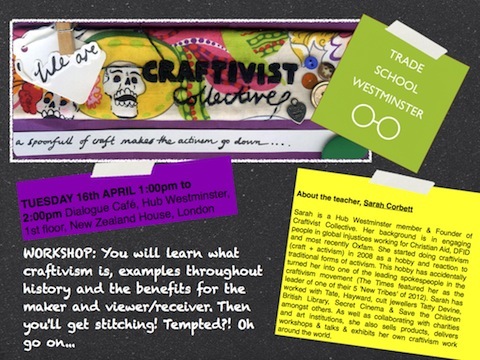 Please share any of your own craftivism creations or reflections in the comments below. we would love to see what your crafty self have been up to. 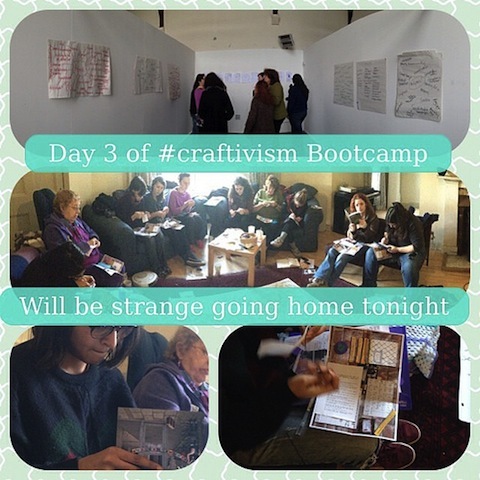 Do check out the blog next week where we will look at what 2014 has in store for Craftivist Collective (including a timetable of time bound projects & exciting news about how many books we will be featured in this year!